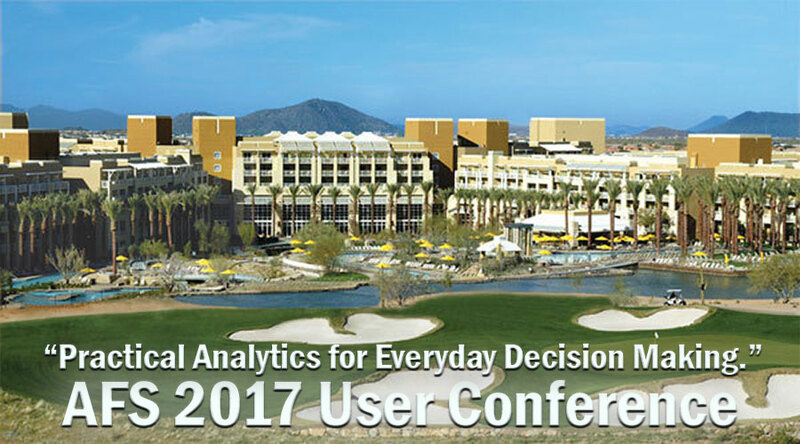 Phoenix, Ariz – May 9, 2017 – AFS Technologies, an award winning global provider of software solutions purpose-built for consumer goods companies, announces its 2017 User Conference, taking place May 17-19 at the JW Marriott Desert Ridge Resort in Phoenix. Over two days, AFS will host 34 sessions covering its major software applications, including Trade Promotion Management Retail/Foodservice, Direct Store Delivery, ePoD, Warehouse Management, ERP, and G2 Analytics. View the user conference agenda. This year, given the increasing global spread of the customer install base, the Retail Execution solution team will host their conference in a virtual e-conference format, taking place a week after the general User Conference. The RE solution discussions will include deep dive reviews around the enhanced DSD capabilities now available as a module in the core RE application. Register here. “I would like to thank our alliance partners, Microsoft, Honeywell, Zebra and Ivanti, – for being sponsors at this year’s event. Their perspective on the industry, along with their platforms and solution components, certainly extends the value that our solutions bring to bear for our customers and for the market at large” added Bellini. AFS Technologies (AFS) is the leading provider of software solutions purpose-built for consumer goods companies. We are committed to generating improved outcomes at the point of purchase coupled with generating efficiencies in trade spend, retail execution and supply chain. With experience developed over its 30-year history, AFS serves more than 1,100 customers of all sizes in more than 50 countries around the world. The AFS products are innovative, configurable solutions that are proven to optimize your potential with automated processes, improved productivity and rapid time to value. To learn more about AFS, visit www.afsi.com.